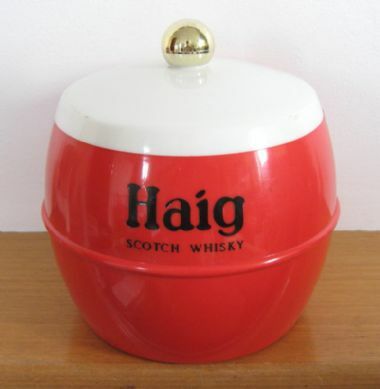 An original vintage / retro plastic ice bucket by Insulex, advertising "Haig Scotch Whisky", in red with lightly embossed black printed lettering to the exterior, off-white interior, and white lid with gold-finish plastic knob; the base is moulded with the "insulex" trade mark and the words "MADE IN ENGLAND / PATS. PENDING". Although there are various signs of age (see condition description below), this remains a displayable - and functional - piece of vintage drinks advertising memorabilia, and as such would make a great accessory for a retro-style interior.